Topp is a design & innovation studio that helps clients develop products, services, and strategies in the connected and digital space. We work globally, and are based in Sweden. The 4th industrial revolution is surfacing more and more Wicked Problems… and this is a challenge for designers. Wicked problems are problems that are seemingly impossible to solve because of incomplete, contradictory, and changing requirements that are often difficult to recognize. Embracing complexity and experimentation is the next frontier for designers, but involves transforming our way of working. James will take a brief look at the evolution of the design practices & mediums leading up to present day. And we’ll talk about making complex technologies tangible, particularly for connected systems, AIs, distributed experiences, and other more wicked challenges like innovation of taxes and refugee crises. James co-founded Topp in 2013, a growing team based out of Malmö, Stockholm, and San Francisco. He’s currently the Managing Partner of the Topp Group, of which Topp Design & Innovation and Noodl, the platform for design experimentation, are part of. “Designers are storytellers”, we’ve often heard, but rarely do we dig down into what that really means. Narrative plays a huge, hidden role in the way we form memories and experience interactions—it’s the iceberg of UX, really—but how often do designers sit down and map it out, from the user’s point of view? How many of us actually bother to write the story? Drawing on over a decade of design, writing and design-oriented content production, this talk argues that a strong narrative is crucial to creating “meaningful” user experiences, and offers a few techniques for crafting one. It also presents some surprising parallels between the writing process and the design process, exposing useful tools for both practices. 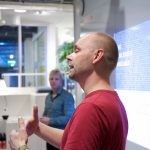 Mathias and Emil from Topp will talk about how to prototype from day one and how this will help you create products that matter. This principle will also be demonstrated in a workshop format using Noodl – our in-house prototyping platform. Emil has a long history of working with prototyping in innovation and production contexts. He’s responsible for the prototyping process development at Topp. Mathias has been working with innovation and product development in a wide range of industries and is passionate about bringing design and technology together. 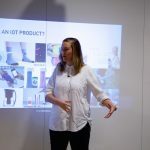 In this talk, Kajsa will share her learnings from working with health and IoT. 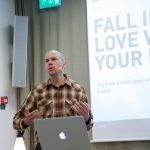 What it means to be a human in a connected world, and how to take a human-centered approach when designing and developing products and services in the area of health. Our health is a sensitive matter and each person’s relationship to it will be unique, this is one of the most important things we need to take into consideration.